Shawnel Resorts offers many other tour packages of Goa such as Dudhsagar Falls Trip, Getaway at Betty's Place, Dolphin Sighting Boat Trips, Wildlife Sanctuaries Tour. Crocodile spotting in Goa carries with it a notion of adventure, yet on board a boat you can forget about the dangers of the ominous looking crocodiles. Instead, you can thrive in the glory of pure natural beauty that surrounds you. A crocodile spotting tour in Goa often doubles up as a river cruise through the rivers of the state. The route for crocodile spotting in Goa starts from the Mandovi River and follows the water channels till Zuari River. You will pass along the swampy, marshlands of Chorao Island as you progress on your crocodile watching trip in Goa. A 2 nights tour with a journey by train into the neighbouring state of Karnataka where you will visit Tiger & Lion Safari with some other wild animals like Deer, Sambhar, Black Bucks and Peacocks. Also visit an elephant training camp where wild and injured elephants are being trained and medicated.............An experience not to be missed. Meeting Point tours organises wild life tours to neighbouring state of Karnataka regularly. 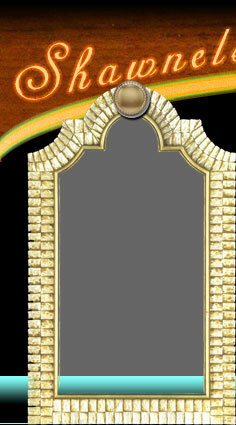 Advance booking a must. Not content on providing a fine dining experience, Betty's Place quickly diversified into other areas to provide additional facilities to the visitors. Roy came up with the idea of investing in a boat that could be used to cruise around in the river. He personally designed the boat with a capacity of 20 passengers. Needless to say, the beauty of River Sal made this idea a hit from day one. Today, Betty's Cruise is unique and considered one of the best deals for the visitors. The boat has been expanded to accommodate 40 passengers with a washroom and a kitchen on board. Roy soon added another boat for those visitors wishing to enjoy the serenity of some of the secluded beaches found nearby. He called his idea "The great escape". Another great idea. 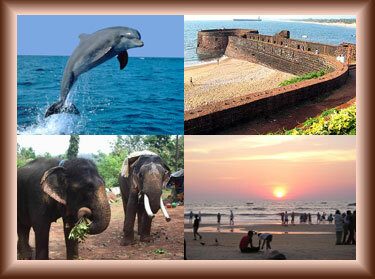 Dolphin watching trips are on offer from many local boat owners on many stretches of Goa's beaches. The actual trip consists of a brief glance of a rather timid than playful creature, and to get a photograph you have to be more lucky than skilful. Dolphins are one of the most-loved creatures of the marine world. Come and see why, on one of the many exciting Meeting Points Dolphin Tours and adventures. These extremely intelligent and playful mammals will delight every visitor with their antics as they play and feed in the wild. Goa offers the easiest access to scuba diving in India. Goa as scuba diving base is best because of its perfect blend of warm safe waters, pristine landscape and vibrant culture. The dive season in India starts in October and ends in May. The water temperatures are in the 27 to 30 degree range. The marine life in Goa is rich in variety. There are sites with coral, rocky pinnacles and shipwrecks to dive. The dives are in the 10 to 15m range. The visibility varies between 5 to 10m over the season. 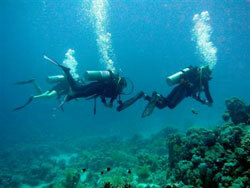 Meeting Point has tie ups with all the diving companies located in Goa. Catching a huge fish can provide quite a thrill and fishing trips are growing in popularity in Goa. Fishing is best in the early morning and late afternoon, and from mid October to mid December in Goa. There is option of deep sea fishing too. These include fishing on the shore, full day deep sea fishing expeditions, and spear fishing off the reefs of Grand Island and Bat Island. Fishing Trips are organised with advance notice required by Meeting Point to organise the event well. 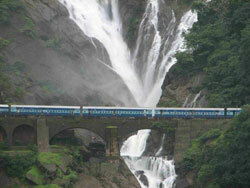 One of the highest waterfalls in India, Dudhsagar Waterfalls are among top 100 waterfalls of the world. The water falls from a height of 200 ft, and creates mist at the bottom, which gives it a pleasant look. Situated 60 Km from Margoa, on the eastern border of Goa-Karnataka. The fall is generally calm during summers. During monsoon, the falls become alive and attracts tourists mostly during monsoon season. Situated on the border of Goa and Karnataka, the Dudhsagar Waterfalls takes a steep plunge 2000 feet down in the wooded mountains of the western Ghats. Believed to be amongst the highest falls in the country, these magnificent falls are located in a blissful tropical jungle with crisscrossing streams. The view from the top of the falls is breathtaking. The falls looks even better at magical light of dawn.